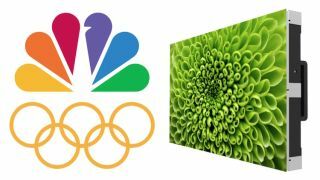 NBC Olympics, a division of the NBC Sports Group, is employing Leyard fine-pitch LED video walls in its production of the XXIII Olympic Winter Games, which are taking place in PyeongChang, South Korea until February 25. Leyard provided three TWS Series LED video walls for the set within the International Broadcast Center. The Leyard video walls include a 43-foot-wide by 13-foot-tall video wall comprised of 196 displays, a 16-foot-wide by 8-foot-tall video wall comprised of 36 displays, and three 4-foot-wide by 7-foot-tall video walls in an athlete interview area.